Champagne and I sat down the evening before the festival took place, in an air conditioned and licensed establishment otherwise known as a bar. Such establishments are greatly appreciated prior to the four day stint of blistering heat and limited amenities, not that the rural swelter isn’t lovely. Champagne is a warm, humble and earnest chap from Australia that currently resides in Nashville,TN. 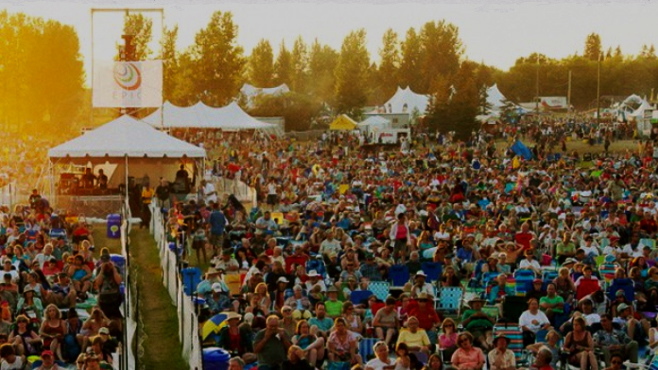 Champagne has an affinity for the inclusivity of Winnipeg and an extensive history of playing at the Folk Fest. His incredibly rich guitar playing is distinctive and impressive for a man in his rather early twenties, his instrumentality is well paired with an appeasing singing voice that explodes with passion. He writes his own songs, learned young and always wants to be touring. His vibrant yet unassuming personality make him an excellent candidate to succeed greatly while refraining from becoming poisoned by his own ego and taunted by self destruction. He respects music and his career within it which is obvious in every little thing about him. The Birds of Chicago are an exceedingly lively group of four that are a such a pleasure to be around. The creators of the band are a husband and wife duo JT Nero and Allison Russell who both encompass a diverse range of musical talent with skills on various instruments and song writing capabilities. Accompanied by the talented Chris Merril and Joel Schwartz, the Birds of Chicago provide fun yet profound music. Nero and Russell bring their beautiful daughter on the road who is greatly nurtured by the empathy that seems to be the foundation of their band. They listen greatly, make acute observations and are each a cleanse of human kindness. Russell’s Francophone background mixed with Nero’s Blues contribution creates a collision that shapes a sound that is strangely reminiscent of old New Orleans flavour whilst staying contemporary and fresh.The combination of Folk-Canadiana that Russell honed through her respective years with Po’Girl and Nero’s authentic Chicago blues immersion creates a reflection of some of Canada and America’s most revered folk music. Xlyouris White is a power duo made up of George Xylouris and Jim White. White’s early career took us through many sounds, moods, and elements of chaos and spontaneity. Through his illustrious years of musical contribution he collaborated with Nick Cave, Cat Power and Smog to name a few. White has developed into a more delicate role while having creative freedom since forming Xylouris White. Xylouris had nothing but big shoes to fill as he followed his family’s route into music. Xylouris’ father (a Cretan singer and Lyra player) to his uncle (who’s music became a symbol for the 1973 movement that eventually brought down the Greek military régime) Xylouris was sculpted to have a significant music career. The two have been collaborating for years and are literally touring across the globe. They are wise, pensive, and thoughtful gentlemen who likely know more than all of us but yet will always stop to say hello. Matt Anderson is one of Canada’s favourite singer-songwriters with a voice like a volcano and a spirit like lightning. He lives in New Brunswick in a generously acred home that offers the inspiration that fuels his music. He loves touring with the extremely well suited Mellotones who play with the same rare ferocity he too embodies. Anderson’s performance at the Main-stage during the festival was like an explosion of passion that paralyzed the audience. There’s no one quite like him; he constantly evolves and truly loves sharing the strange and wonderful experience of making music. Steve Gunn is the truly gifted singer songwriter from Brooklyn who formally played guitar in Kurt Vile’s band The Violators. His music is a sound I have been looking for. He strings together elements of a Bert Jansch-esque guitar approach combined with his gentle voice and lyrics that both break apart and stitch up your heart. Talking with him is similar to how his music sounds: inviting, non-judgmental and sweet yet it’s not saccharine or superficial in any way. Gunn shared with me that he collects albums, records his must at home, just finished touring with Wilco and has played all over the world. He discussed the importance of maintaining both mental and physical health while on tour despite the various distractions and deviances the road has to offer. Gunn has an impressive 11 albums under his belt yet still laughs like a teenager and performs with a sense of newness that could sweep you away.